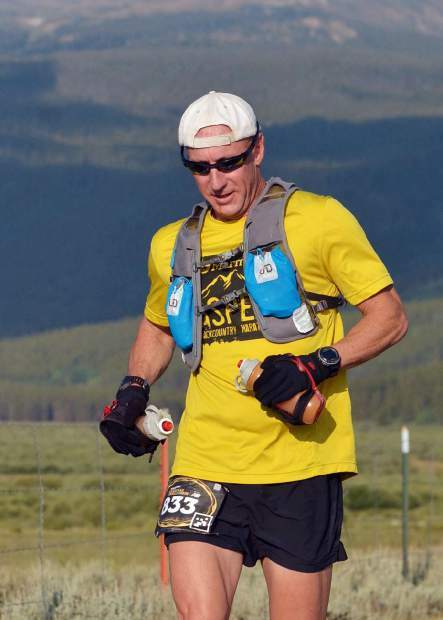 Aspen ultrarunner Andy Wooten completed his 10th 100-mile endurance race this year. Aspen’s Andy Wooten wasn’t having much fun last month when competing in the Run Rabbit Run 100-mile ultra in Steamboat Springs. Midway through the race, he questioned the very reason he was there. Once he committed to enjoying the race, everything fell into place. Wooten backed off the gas pedal, even taking an hour and a half break at one of the aid stations, knowing he could still finish within 30 hours. The goal now was simply to finish, and that he did. Wooten finished the 100-mile trail race in 29 hours, 50 minutes, 19 seconds, taking 49th in the “tortoise” division, as opposed to the speedier “hares” division, won by Littleton’s Jim Rebenack in 18:44:48. The finish was big for Wooten, 49, as it was the 10th time he had completed a 100-mile ultra in his lifetime. Wooten ran his first century race in 2009, where he failed to finish the prestigious Leadville Trail 100, barely making it halfway. He returned in 2010 and finished, the first of his now 10 completed 100-milers. Wooten, a mental health case manager for Mind Springs Health, moved to Aspen in 2013 from the Front Range. His trail running career began in the mid-90s, when he competed in the Pikes Peak Ascent, as that was the “crazy thing” to do back then. More than a decade would pass before Wooten competed in his first 100-mile race, something he never thought possible. All told, he’s completed the Leadville 100 six times, the Run Rabbit Run three times and the Rocky Raccoon 100 in Texas once. He was going to compete in the famed Hardrock 100 this year as well, but pulled out of the race in May. He said bad running weather in the spring wore him down to the point where he didn’t want to push his training through the summer. The good part about finishing RRR this year is that it is a Hardrock qualifier. Wooten said he should have at least a 75 percent chance to have his name drawn in the lottery, allowing him to finally race in the Hardrock at age 50. And running in one of the country’s most notorious 100-mile races at that age might be a good way to go out, should he decide to do so.